I haven’t cleaned this window for years. (Stand, pretend to wipe a window with the rag, facing the audience. From time to time, stand on tiptoes, shading eyes as if gazing out the window.) 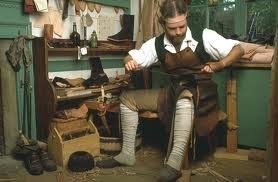 I’ve let my tiny shoemaker’s shop gather a lot of dust. It doesn’t earn me much. Our dear Russian Tsar takes half of my profits in taxes. (Approach from one side) Cobbler, you’re tidying up your messy shoe shop! It’s neat for the first time since your wife died two years ago! Are you expecting the Tsar? Someone more important than Russia’s grand monarch! The Lord is coming to visit me. I had a dream, and it was so real! He’s coming to my shop before sundown. (Come toward Cobbler as he watches out the window again, straining to see.) Cobbler, I need work. My shoes have worn out and it’ll soon be freezing. Oh, these ruthless Russian winters! I don’t do enough business to hire help. Please don’t bother me now; I’m expecting someone important. (Turn, scream in pain, hop around holding one foot) I stepped on a nail! Oh, here! Take these! (Toss shoes to him.) I’ll probably never sell them anyway! (Hold shoes up to examine them.) Oooo! (Slip shoes on, limp toward the door.) Ouch! They hurt! (Approach Cobbler) Cobbler, I’m out of work. Can you lend me a ruble? I do not have a ruble to spare. Good-bye, and have a good day. I haven’t eaten since those Cossacks commandeered my horse and cart. (Approach Cobbler) Cobbler, my clothes are all worn. I need help. I’ll clean your shop for you. Come back another day, please! I’m busy, and I’m expecting someone important. Maybe there’s some old rags around here that I can wear? Winter’s coming. There behind the counter is a jar of milk. Help yourself on your way out. (Approach Cobbler) It’s after sundown, Cobbler. How did you get along with your grand visitor? (Shake your head, groan, and shout angrily) Go away! Go away! Did the Lord anoint you as Archbishop? (Laugh derisively.) Maybe He brought a message from your wife! (Run, then return) I’m sorry! That was thoughtless of me. Very thoughtless! Ohh! Let me cheer you up! Did you do good business today? Business was ruinous. I gave everything away! Now stop mocking! No one came except a barefoot man, and I gave him shoes to get rid of him. A guy came begging for work, and I gave him my lunch. A widow came and I gave her my wife’s coat. What did you say? (Shake Cobbler’s shoulder) WHAT DID YOU SAY? He came! He came, Cobbler! I mean it! I’m not making fun! He really came! Oh, Lord! Oh, Lord, forgive me!